After a very lazy time on Nusa Lembongan, we headed across to Ubud for the second part of our holiday, ready to do some seriously good eating. We stayed at Honeymoon Guesthouses, owned by Janet de Neefe, who has run food businesses, festivals and accommodation in Ubud for 25 years. The guesthouses are spacious and comfortable, although we found our outside chairs already occupied when we turned up (see above). Food-wise, we spent our first night at Indus Restaurant, which is part of the de Neefe empire - the hotel puts on free transport to and from the restaurant and you get a 10% discount if you're staying at Honeymoon. Indus is beautifully situated, with a terrace looking over a lush river valley - we got there right on dusk, so we only had a few minutes to enjoy the view before focussing our attention on the food. I had the vegan nasi campur (IDR70k - $6.70) - a plate of rice and goodies including pumpkin, curry eggplant, tofu, snake beans, jackfruit and the best tempeh I've ever eaten. Cindy went for the jackfruit rendang, with green beans, coconut milk, crispy shallots and red rice (IDR85k - $8.10), which was nearly as good. 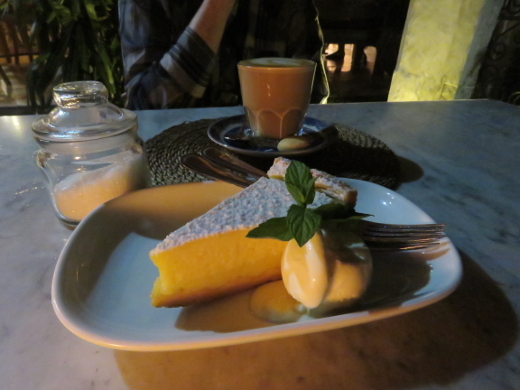 We left enough space for our first real dessert of the trip, a slice of Casa Luna's famous lime tart (IDR60k - $5.70) - it easily lived up to the hype. 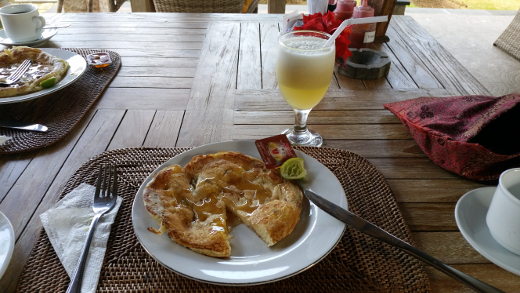 We had five mornings at Honeymoon Guesthouses to sample the full range of breakfasts they offered up (breakfast was part of the package) - it was such a treat to have fresh fruit and fancy juices for breakfast every morning. 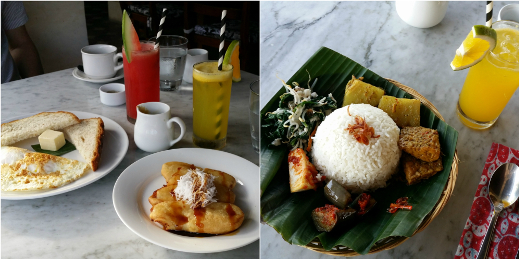 This was followed by our choice of main: banana-stuffed pandan pancakes, banana fritters, French toast with palm sugar syrup, eggs and, most impressively, a vegetarian nasi campur. Tempeh for breakfast is the best. Coming back to cereal for breakfast has been one of the hardest parts of the holiday being over. Our other Casa Luna food-related experience was a half day cooking class the involved a tour of the Ubud market (right before it changed from the locals market to the touristy one). 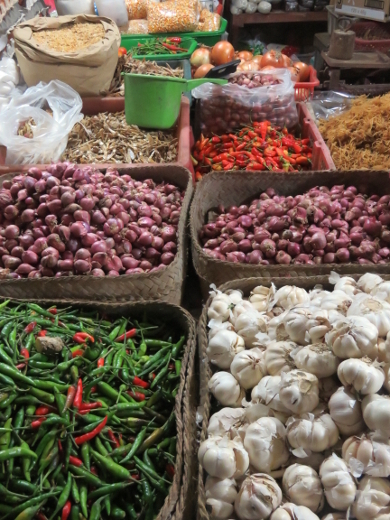 It was fun to get a rundown of the local produce and to get a sense of how locals do their shopping. 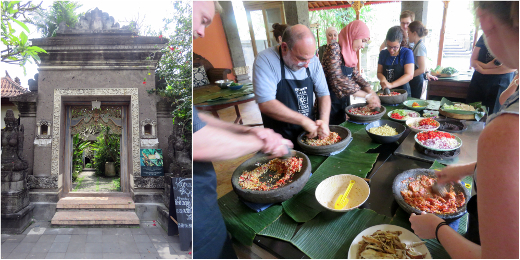 After we finished at the market, we headed back to the cooking school to get stuck into some Balinese cookery. A group of about 12 of us pitched in to produce a ridiculous feast: two kinds of coconut salad (urab pakis), a tempe curry, a roasted eggplant sambal (sambal tuwung), a fried chilli sauce (sambal goreng), a raw chilli seasoning (sambal matah), fried noodles (mie goreng) and a fish curry (ikan mekuah). The hands-on parts of the course were tag-teamed, so people took turns grinding up spices pastes, chopping and frying things. The food was astonishingly good, and the course was well suited for vegos (the mie goreng was split into two batches - one with fish sauce and one without). While we ate the savouries, the instructors whipped up a batch of pandan pancakes stuffed with palm sugar and coconut, an amazing way to end a fantastic meal. Look out for some of these dishes on the blog in the next few months. We had a wonderful stay at Honeymoon - the staff were super helpful, the pool was great and everything we ate or drank that had any connection with the place was delightful. We'd definitely stay there again. 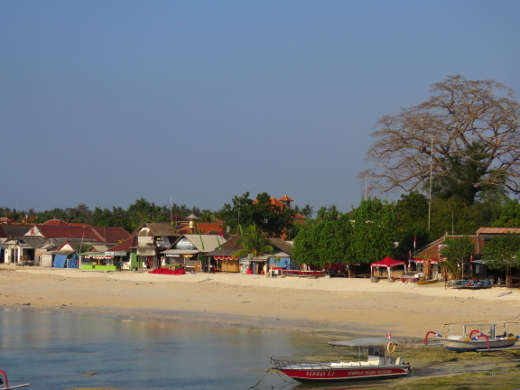 After our first night in Seminyak, we quickly escaped to somewhere a bit less intense, Nusa Lembongan. 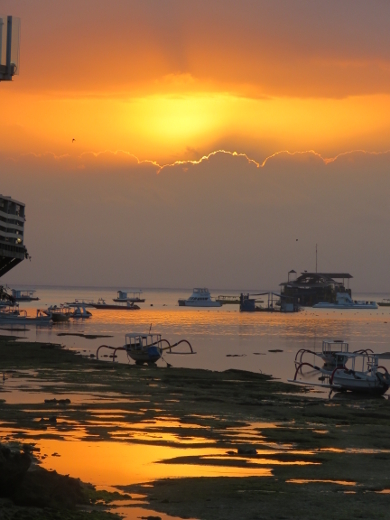 It's a little island about 50km east of the main island of Bali and has a much more relaxing vibe. We stayed at Sunset Garden, a lovely little hotel with gorgeous villa-style accommodation, a terrific pool and a cute little restaurant. We didn't have much luck with vegetarian food there for lunch and dinner, but we hit them up each morning for breakfast - fresh fruit, juice or coffee and a decent selection of mains to choose from. Cindy couldn't resist the pancakes (with pineapple or banana), while I went for tomato, cheese and egg jaffles most mornings. It was a good start to the day. 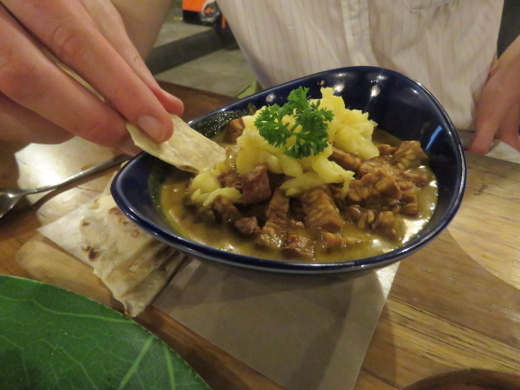 There weren't heaps of vego options in our neighbourhood - most places offered up a couple of meaty Indonesian dishes alongside heaps of weird western food - burgers, pizzas and the like. 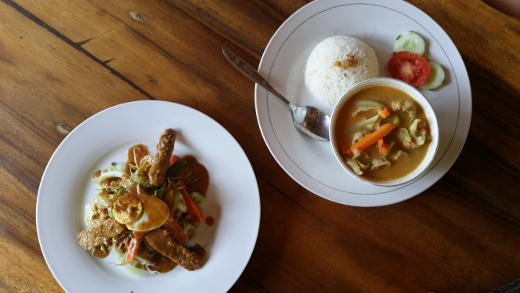 We were in Indonesia to eat tempeh, so our eyes lit up when we saw that the restaurant at Mushroom Garden Villas had both a tempeh curry (IDR40k - $3.75) and gado gado (IDR35k - $3.30) on the menu. We stopped in for lunch on our way to the beach and had a very satisfactory meal. We were even happier when we wandered past Oishii Bar & Grill, just around the corner from our hotel, and saw the word 'vegetarian' painted on their sign outside. 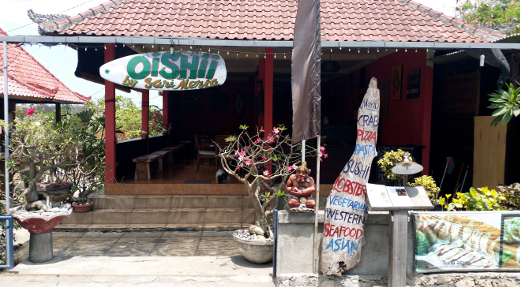 They're a primarily Japanese place, but like most restaurants on Lembongan do a bit of everything (more pizza and burgers, plus some Indonesian food). 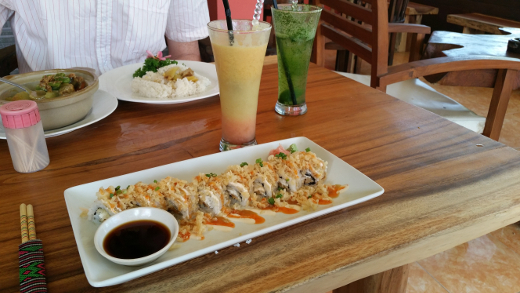 We had a couple of meals there, featuring some excellent crispy tempeh sushi rolls, avocado rolls, tempura veggies and a decent tempeh and vegetable curry (meals were between IDR50k-80k, so about $4-$8). Like everywhere we went, they sold beautiful fresh fruit juices (and pretty decent cocktails). 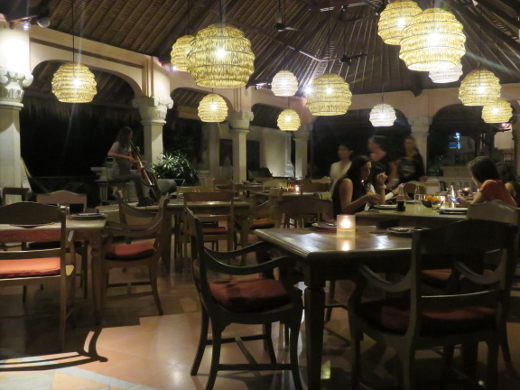 While we were there we got a good tip from Amy that the best vego food on Lembongan was at Pisang-Pisang. It was right across the other side of the island from where we were staying, but we sorted out a taxi over to that side of town for some beachside cocktails and a wander down for dinner. 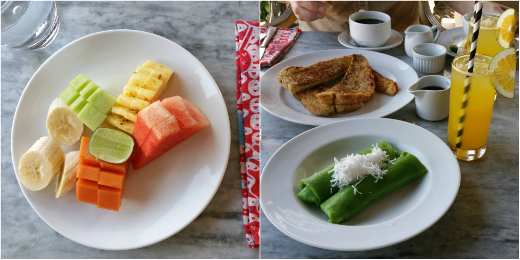 It was well worth the trip - Pisang-Pisang has heaps of vegan options, easily the most we found on the island. Cindy had some delightful salt and pepper tofu (IDR42k - $4) while I had an amazing tempeh masala curry with fresh pineapple and roti bread (IDR60k - $5.60). The only challenge was finding a night-time ride back to our accommodation! 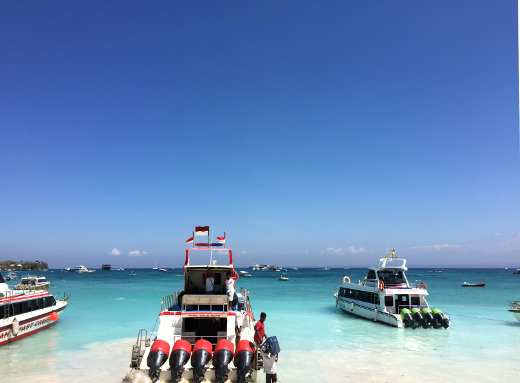 We had an incredibly relaxing time on Lembongan - it's a beautiful and calm place to hang out. 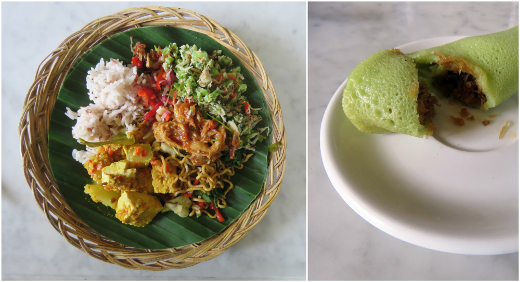 The vegetarian food doesn't hit the heights of the more heavily touristed parts of Bali (see Cindy's forthcoming Ubud post for some real highlights), but we ate well and cheaply. You wouldn't go to Lembongan for the food, but there's enough to sustain all that pool-side lounging. 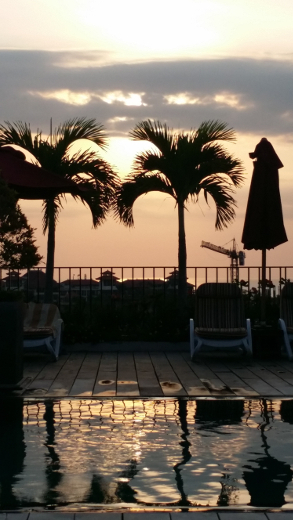 Michael and I have just returned home from our first holiday in Bali. It was a fabulous, relaxing experience and we're both hoping that it won't be our last visit to this island. Over the next week on the blog we'll be writing about our favourite meals during our travels. 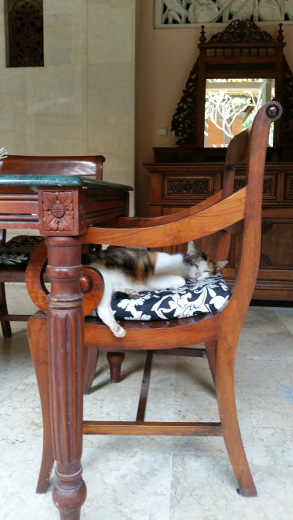 We spent just one evening in Seminyak when we arrived. Lined with surf clothing shops, restaurants selling pizza and seafood, and crowded with sunburned Aussies, it reminded us of the Gold Coast. Michael picked up some eating tips from VegieHead, and we ate dinner at Chandi. 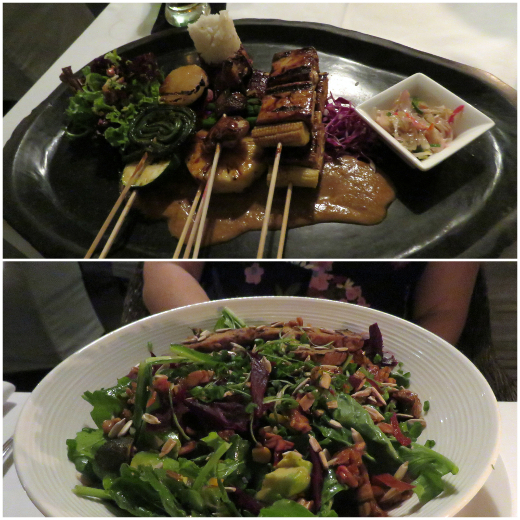 It was an expansive restaurant aimed at travellers, with a clear vegetarian & vegan section in its menu. Michael went all out on the Vegetarian Sate Platter on River Stone (IDR154k ~ AU$14.30), a selection of vegetable skewers including bacam tofu, coconut milk marinated tempeh, and caramelised pineapple. I was just as delighted with my Tempestuous Arugula Avocado Salad (IDR86k ~ AU$8.05), even though it only had three teeny avocado bites - it was scattered with coconut oil-fried sunflower seeds, shallots, chilli & tempeh chips, and dressed with lemongrass. Our hotel had a good reputation for its breakfast spread, and we were slow to take stock of the entire spread. There was the typical western stuff: eggs to order and bacon; toast with jam, Nutella or Vegemite; cereals and a pancake station (! ); a more European spread of cheeses and cold meats; then the tropical fruits and juices I craved, and clay pots with south-east Asian foods. I lined my stomach with fried eggs and rice, pickles, fried shallots and doughnut pieces, then finished up with a bowl of fruits. 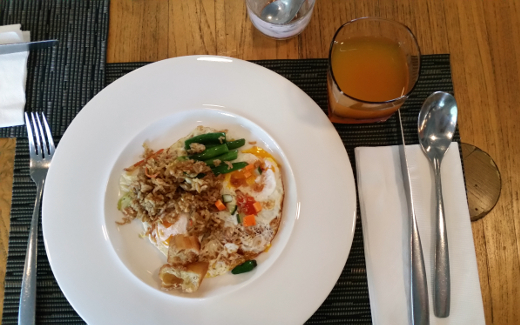 I loved it, and I loved anticipating many more such breakfasts to come. I have nothing new to share with you here. You already know that over-ripe bananas are perfect for banana bread/cake. And you already have at least one great recipe for that (I've got about six such posts on the blog, myself). And what's more, I bookmarked this one from a blog in 2008. But, but, but. This cake includes molasses, and that changes everything. In the raw batter it's too dominant, too minerally; in the baked cake it's mellow and malty. The bananas aren't as distinct as they are in other banana cakes, they're just supporting the overarching sweetness agenda and ensuring a dense, moist crumb no matter how volcanic and crusty the cake's surface becomes. I stirred dark chocolate chips and walnuts into my banana and molasses cake, and cut thick slabs of it for afternoon tea over the course of a week. (It wasn't robust enough to sustain slices less than about 15mm thick.) I like that walnuts are a bit softer and woodier than most other nuts, melding a little into the cake and lending only a subtle texture contrast. Heat an oven to 180°C. Line a loaf pan with paper and lightly spray it with oil. In a large bowl, thoroughly mash the bananas until as smooth as possible. Stir in the apple puree, oil, sugar and molasses, whisking to combine. Sift in the flour, bicarb soda, cinnamon, nutmeg and salt, and stir until just combined. Fold in the chocolate chips and walnuts. Pour the batter into the loaf pan and bake it for about 45 minutes, until a skewer inserted into the centre comes out clean (it's OK if the batter still feels a bit damp!). Allow the loaf to cool a while before slicing and serving. The Iranian stew that Michael made this winter has left us with a lot of extra dried barberries. They're small, bright and tangy, and they're also commonly served with saffron rice. The rice dish zereshk polow typically involves chicken, but Ottolenghi has a version on his website that doesn't include a bird in the ingredients list. This is really fancy rice, designed to be a centrepiece dish. It's coated in butter and infused unevenly with saffron, so that the tossed grains show ombre yellow. There's green herbs and pistachios as well as the red barberries, so there's lots of variety in texture and flavour. We couldn't locate any chervil on the day we prepared this, so we were just a little more generous with the other herbs involved. The half-dozen other polow recipes that I looked at didn't include any green herbs at all, so there's clearly no particular need for it. I'm still not really sure what the best vegetarian alternative to chicken might be alongside this rice, but we enjoyed eating it with tempeh burgers that were drizzled with tahini. It made a terrific packed lunch for work, too! Put the kettle on to boil and place the saffron in a small mug or heat-proof bowl. Pour 3 tablespoons of boiling water over the saffron and allow them to soak for at least 30 minutes. Place the barberries and pinch of sugar in a separate small heat-proof bowl, and pour boiling water over them until they're covered. Let them soak a while too. Rinse the basmati rice and allow it to drain. Boil the kettle again. Set a medium-large saucepan over medium-high heat and melt the butter in it. Add the rice and stir it around to coat the grains in the butter. Pour 560mL boiling water into the rice, and sprinkle over the salt and white pepper. Give it a stir, pop on a lid, and turn down the heat to low. Cook the rice for 15 minutes and don't be tempted to lift the lid! While the rice is cooking, roughly chop the dill and tarragon. When the rice has absorbed all the water, pour the soaked saffron water over one quarter of the rice's surface, leaving the rest white. Cover the saucepan with a tea towel, replace the lid and allow the rice to rest for 5-10 minutes. Transfer the rice to a big bowl. Drain the barberries and stir them through, fold in the herbs and most of the pistachios. Serve sprinkled with the remaining pistachios. Vegans-in-the-know N & I have introduced us to Black Waffle on High St. 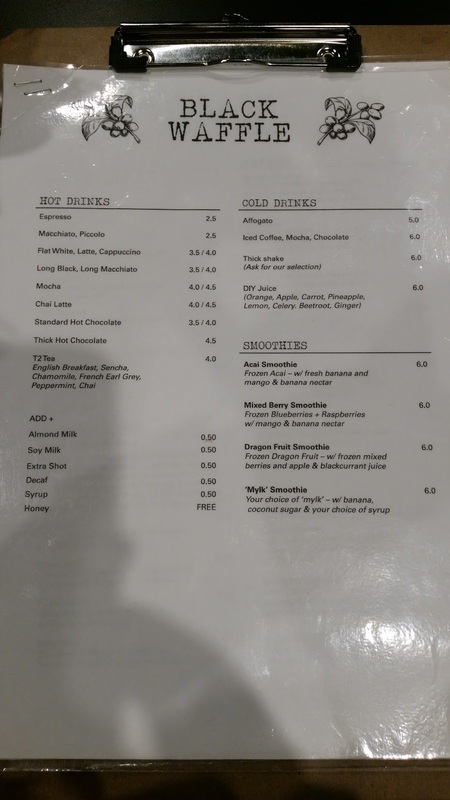 This cafe has a cabinet full of gelato, and a menu full of smoothies, bagels and (of course) waffles. 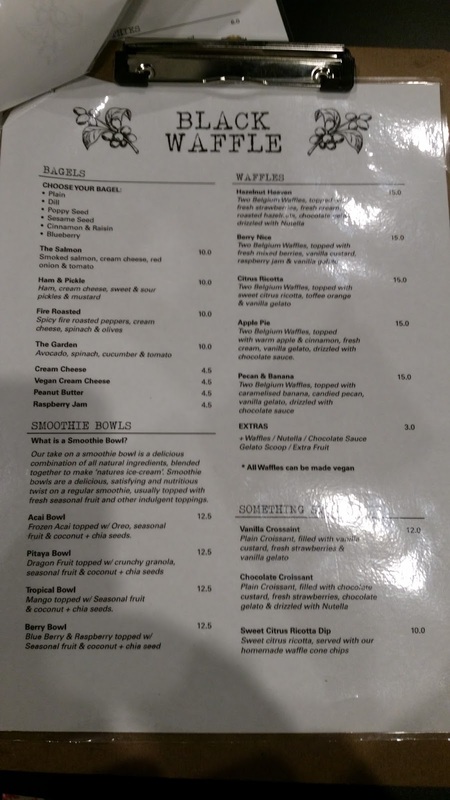 There are vegan options tucked into every section, and every last waffle plate can be veganised! 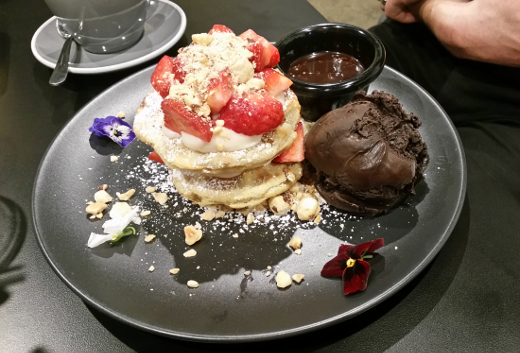 After a meal at Loving Hut, we shared in Hazelnut Heaven ($15, pictured above). The two waffles were cute and modestly portioned, sandwiched with strawberries and vegan cream and sprinkled liberally with hazelnuts. The plate was rendered utterly immodest with a cup of molten 'nutella' and stout scoop of dark chocolate gelato. This is a treat well worth saving room for... or even skipping dinner altogether! Black Waffle has already won fans on The Brunswick Brunchie (freebie), The Penguin Eats, he is hungry, and Curious Charlie. Accessibility: Our memory is of a flat entry, gentle ramp indoors and a clear corridor through the shop. We ordered and paid at a low counter. We noticed Handsome Her almost as soon as they posted their coming soon note on the door. 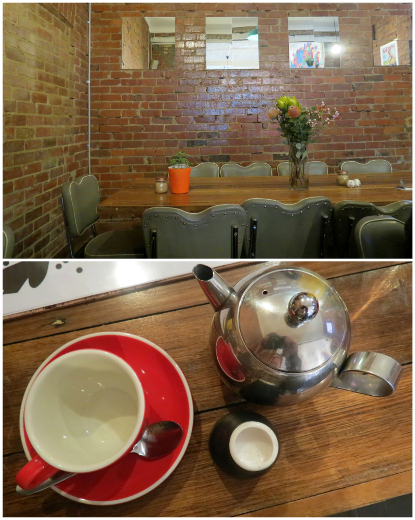 This cafe's located within our regular roaming distance on Sydney Rd, and we were curious to see what would replace the unexpectedly-departed Bar Estrella. The note included news that cheered us and attracted a little media attention: Handsome Her would not stock takeaway coffee cups. Instead, customers seeking their morning shot could take a standing spot for a discounted price (as it's done in Italy), bring in their own cup or grab something reusable from the emergency mug wall to take away. A second resolution attracted even more, and more mixed, attention. Handsome Her is an explicitly women-centred space, holding social justice, feminism, community development and, yep, environmental responsibility as its core values. As a consequence, they invite male customers to pay 18% more on their visits than other customers to redress the gender-based pay gap, with proceeds directed to a women's service. While Handsome Her's values are serious, the atmosphere is upbeat. The 100% vegan menu includes four kinds of 'milk', coffees, teas, novelty lattes, smoothies and blended-ice beverages. Meals are named after inspirational women, and are all complex concoctions with sauces, sprinkles and edible flowers. (That some of the staff previously worked at Glass Den makes sense!) Just about everything has a gluten-free option. I had eyes only for Michelle Obama ($20, pictured above), a plate that starts with brownie hotcakes. These didn't have the depth of cocoa that I'd hoped for, but all the trimmings kept my taste buds active: peanut butter mousse, caramelised saffron bananas, salted caramel brittle, lemongrass infused coconut cream, matcha popcorn and strawberry baobab icecream. After some deliberation, Michael chose Park Yeon-Mi ($23). It's a huge board carrying a charcoal bubble waffle, tumbling mock drumsticks glazed in Korean sweet and spicy sauce, cucumber kim chi, turmeric infused daikon, pickled carrots, dots of tofu emulsion and a scattering of rainbow slaw. It was glorious! The following weekend, we returned to venture further into the menu. 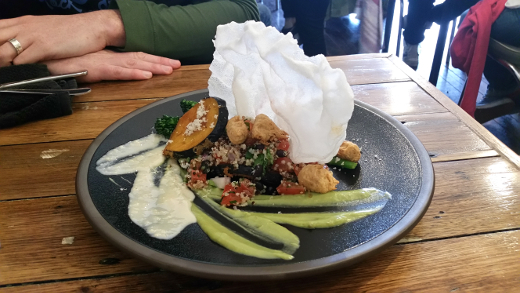 Michael selected more mock in the Yoko Ono ($18.50), a slightly more restrained plate of polenta-crusted eggplant, quinoa black bean tabouli, roasted broccolini and chicken nuggets, with streaks of avocado puree and goma emulsion and an oversized spicy rice cracker. 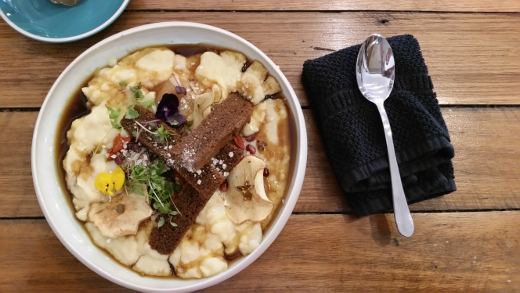 I settled in with Celeste Liddle ($15.50), a bowl of polenta porridge with plentiful fruit and nuts - dates, pistachios, pomegranate and apple three ways (fresh, dehydrated chips, and cooked down into a sauce). It's finished off with the requisite flowers and microherbs, plus Gula Melaka syrup and gingerbread batons. Not much could tempt me away from brownies for breakfast, but this did it and it could win out again. Even in these first harried weeks of trade, we received confident and efficient service from unfailingly friendly staff. We're looking forward to ticking off what remains of the menu, and likely becoming regular local customers in the process. Accessibility: The entry is flat, and tables are densely packed with a clear corridor through the middle of the cafe. We ordered at the table and paid at a low counter. We haven't visited the toilets, but we noticed a 'wheelchair accessible' sign beside the directions leading to the loos.